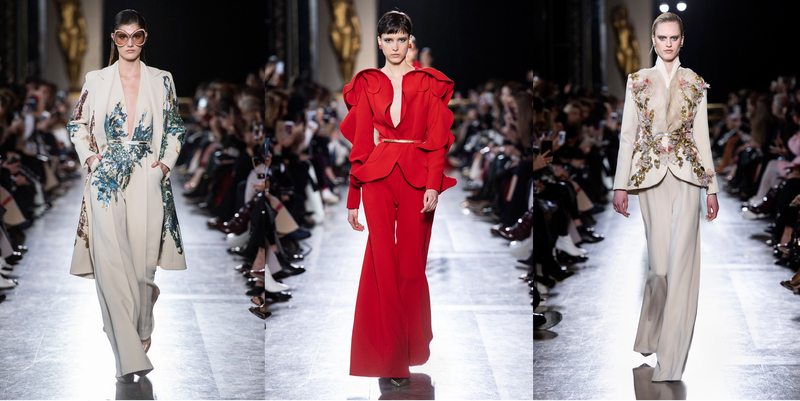 Through this Spring-Summer 2019 Haute Couture collection, ELIE SAAB borders on the enchanting and the mystical to blur the lines between real and surreal, while sanctifying the feminine body, adorning it with scintillating skin. Inspired by the rich and abundant underwater flora of the Caribbean, every piece is like an ode to the magical lifeforms that animate the depths. Sumptuous fabrics, such as organza, tulle, satin Duchesse and iridescent taffeta, are layered to take on the shapes of the ripples and the symmetry of corals, the organic architectural creases of seashells, the flowy movements of anemones and their feather-like softness that sways in the currents. Beading and sequins translate the ever-changing hues of shimmery abalone and mother of pearl into patterns and volumes. Hand-painted fabrics and exclusive patterns boast ample splashes and brush strokes of aquarelles that invite you to dive into this world of dazzling colour. The Maison’s unique craftsmanship and intricate embroidery techniques create sumptuous textures that bring this delicate yet flamboyant extravagance to life. Throughout the collection, pieces and silhouettes take on an array of forms to fit every aspect of this luxurious island lifestyle, from figure-hugging mermaid cuts, with asymmetric volumes, to summery coats and jackets, cocktail pieces and even embroidered high-lux swimsuits with long draping capes. The accessories come in to further highlight the collection theme, with earrings, chains in a fishnet-like composition, all embellished with patterned aquatic stones, large-framed eyewear and lustrous gold shoes. 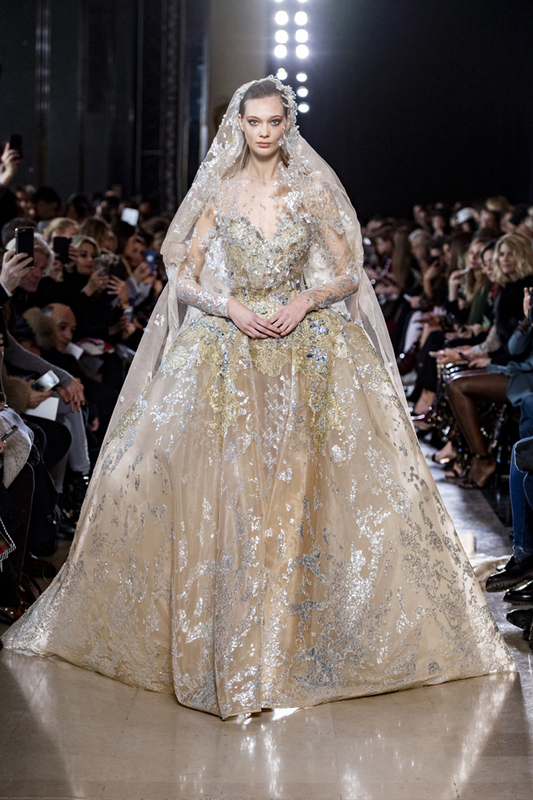 The bride by Elie Saab. © Elie Saab. The Spring-Summer 2019 Haute Couture collection inspires chic sun-kissed escapades, sailing across diamond-like seas to reach lavish, paradisiac beaches where glamorous silhouettes bring a sensual feel to feminine forms that blend with water and shine on land.